Banjul - Gambian police said on Tuesday they were working on more than 30 cases of individuals who disappeared in custody under Yahya Jammeh's former regime, as investigators uncover secret burial sites. Crime management co-ordinator Babucarr Sarr told media that 33 case files had been opened since January, with several more expected, and 10 people were in custody including members of Jammeh's 'Jungler' death squad. "Thirty-three files have been compiled," Sarr said. "We have about seven cases in which we have a lead so far." It is the first time Gambian police have given a figure for forced regime disappearances since Jammeh left power in January after 22 years of iron-fisted rule. He handed power over to President Adama Barrow following a protracted handover crisis in the tiny west African country. The remains of four men have been exhumed so far, including the body of opposition activist Solo Sandeng and three coup plotters who unsuccessfully tried to oust Jammeh in 2014. Momodou Njie, whose nephew Lamin Sanneh was found near the former president's home village of Kanilai last week, said families wanted the government to return bodies for a proper burial. "I would like them to be buried in a place, in our Muslim way, and the place will be marked as a national monument," he said. Njie had received death threats and threats against his wife and property, he added, and said the government should stop intimidation by Jammeh supporters. Colonel Lamin Sanneh, who served in Jammeh's presidential guard, Alagie Nyass, and Njaga Jagne -- who served in Iraq for the US army - were among those who mounted an attempt to overthrow the former president in December 2014. All three men were known to have been killed in the immediate aftermath of the coup attempt, but the full circumstances of their deaths were unclear until now. 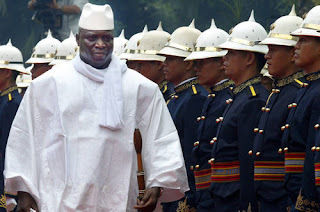 Members of Jammeh's ultra-loyal death squad, known as the "Junglers", have long been accused of carrying out extrajudicial killings and torture by the United Nations and rights groups. Several of them are among those in custody and are cooperating with the authorities, Sarr said, as the interior ministry investigates a litany of unsolved disappearances. "We need to ensure there is a proper mechanism and system for dealing comprehensively with the unfortunate incidents that have happened in this country since 1994," justice minister Abubacarr Tambadou told AFP on Tuesday. Tambadou is spearheading efforts behind a truth and reconciliation commission due to begin work in six months time, which will hear victim's testimonies and decide on future prosecutions.